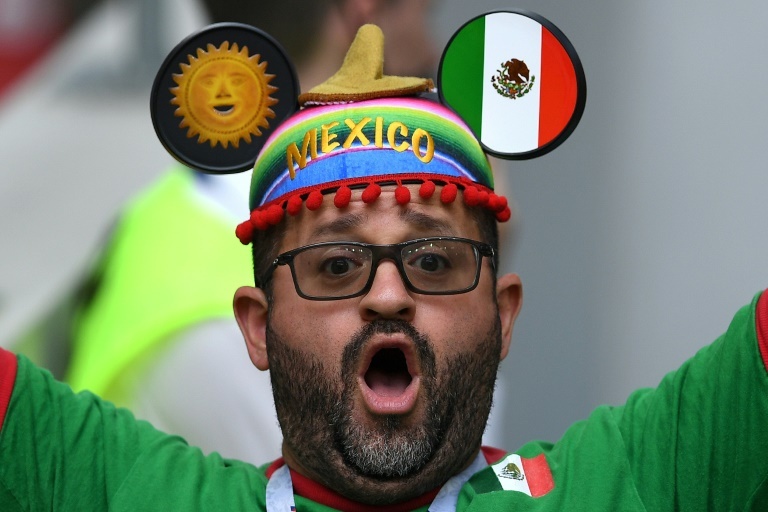 MOSCOW: Latin American countries have sprung a World Cup surprise by filling Russia’s 11 host cities with tens of thousands of fans from Mexico and Colombia to Peru and Argentina. And some of the Europeans who did show up said their friends back home told them they were crazy to go. The contrasting cast of supporters at the biggest event in sport reflects Russia’s progressive creep away from Europe in the 18 years of President Vladimir Putin’s rule. Moscow is now embracing new allies that happen to worship football and where damning — and often exaggerated — media stories about Russian hooligans and poisoning cases are rare. This mix and the added ingredient of a more evenly spread-out global middle-class with the means to travel the world has the streets of Russia dancing to a decidedly Latin beat. “We didn’t expect it to be this beautiful and the people are amazing,” Mauricio Miranda said as she waved a Colombian flag on the edge of Red Square in Moscow. “We will definitely come back,” said the 30-year-old. Belgian public relations consultant Jo De Munter does not necessarily disagree. It is his friends who do. “I think Europeans are a bit afraid,” the 46-year-old said while staring in the direction of Lenin’s Mausoleum. World Cups come in all shapes and sizes and comparing ticket sales rarely tells the whole tale. Europeans and Latin Americans are naturally more inclined to attend World Cups held in their regions because of the easier travel arrangements and familiarity. South Africa in 2010 may provide a better example because it was a frontier football country with specific security and logistical risks. Yet FIFA figures showed almost 50 percent more Britons bought tickets for the African continent’s first World Cup than this maiden one in eastern Europe. Australians were in third place then but are just ninth in Russia. Germany and England bought the fourth- and fifth-most number of tickets. France was ninth. But France dropped out of the top 10 in Russia while Britain slipped down to last place. Germany remained fourth. The United States has long led purchases among non-hosting countries because of its massive economy and large communities from football-mad Mexico and other Central American communities. Taking the US out of the equation leaves Latin Americans accounting for two-thirds of the top 10 countries that have bought tickets for Russia. Fans banging Mexican drums and sporting the red-and-white bodypaint of the Peruvian flag encountered on a Moscow summer’s day were almost all big city office workers. Colombia’s Miranda is an urban planner with a new job in Canada. Alexandro Grado is a former financial consultant with Mexico’s Citibanamex who now owns a plastics recycling firm. “Going to Russia is not expensive if you buy everything ahead of time,” Grado said. Yet not all fans can afford to go bar hopping near the Kremlin and sociologists who study the sport say this is where Latin American football federations come in. “There are national teams which have very strong organisational support behind them. Argentina in 2010 was one example,” said Ludovic Lestrelin of France’s Universite de Caen in Normandy. Lestrelin said less well-off fans in Europe get far less travel and accommodation assistance from state agencies and are increasingly more likely to stay home and watch on TV. This means Europeans attending World Cups tend to be richer than the average football fan. The travelling Latin Americans are more likely to come from all types of backgrounds. “Those who travel to Russia and other places do not reflect the social makeup of French stadiums,” said Lestrelin. Zbigniew Iwanowski of the Institute of Latin American Studies in Moscow said Russia is further reaping the rewards of a “pink tide” that brought anti-US leaders power across the continent. “The pendulum has swung back to the right but they still have (Russian state media) like Sputnik and RT,” Iwanowski said. Few would argue that Russia generates a lot of negative headlines in Europe in general and Britain in particular. But the media’s role in shaping public opinion — and the reverse — is all but impossible to gauge. What is clear is that at least some of the Europeans who ventured to Moscow and beyond did so with a degree of trepidation the voyagers from Latin America lacked. De Munter said he often travels to watch Belgium play abroad. Rarely has he seen the national team’s support so small. Gherardo Drardanelli flew in from Italy to take part in one of the fan tournaments organised alongside the World Cup.